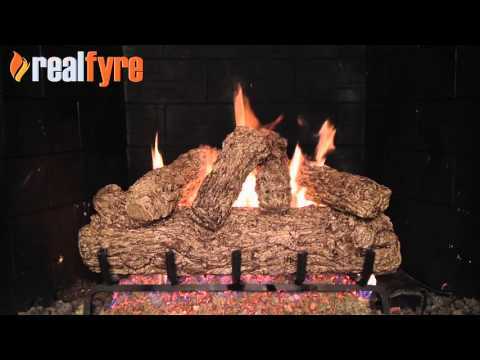 Peterson Real Fyre Classic Series Gas Logs have withstood the test of time with traditional favorites, like the Rustic Oak, and by utilizing the most innovative technologies to help safeguard the environment. Their attention to log detail, log texture and flame presentation produce elegant fireplace displays that fill any room with comfort and beauty. This Peterson Real Fyre gas log set includes: Ceramic Refractory Vented Gas Logs, Vented Glowing Ember Burner, Custom Grate, Connector Kit, Glowing Embers, Sand, Burner Clips, and Damper Clamp. The Peterson Real Fyre vented G4 Burner with its single burner pipe allows the flames to dance through the center of your log set and has a BTU output of 39,000 BTUs. This natural gas set features a match light system that uses your existing wall key valve and does not include a control valve.